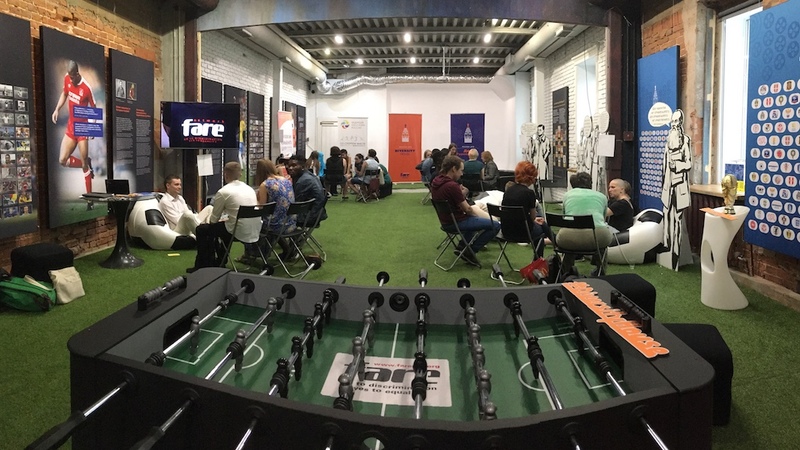 Fare is running a Diversity House project in Moscow and St. Petersburg. Diversity House is a place to celebrate diversity and explore the history, people and movements that are creating change. Both Diversity Houses will feature a football exhibition, discussions and meetings with Russian groups, supporters and residents. It is open to everyone, everyday of the World Cup from Russians and visiting fans. The Diversity House takes its inspiration from the Pride House International movement which has led the idea at international sports events. In Moscow, you can find the Fare Diversity House here. Address: Bolshoi Spasoglinischevskiy pereulok, 3. (Большой Спасоглинищевский переулок, 3) – it is 10 minutes walk to the East of Red Square. One minute from the Kitay-Gorod metro station. In St. Petersburg, the Diversity House and a coalition of grassroots initiatives will be located at Berthold centre, Grazhdanskaya, 13-15. Follow www.farenet.org for the detailed programme of events and activities.